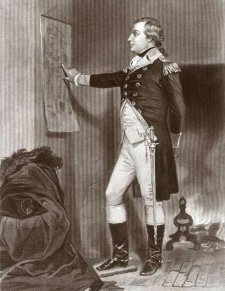 On this day in history, November 13, 1775, American General Richard Montgomery takes Montreal without a fight. The Americans had decided to try to take British Quebec in the fall of 1775. This was the first military offensive of the new Continental Army during the Revolutionary War. Their goal was to take Quebec and convince the French speaking citizens to join them in their rebellion against England. General Guy Carleton was the Royal Governor of Quebec. Carleton had focused his efforts against Ethan Allen of Vermont, who tried to take Montreal in September. Carleton's distraction with Allen allowed General Montgomery to take Fort St. Jean, the main British defense post south of Montreal. The fort was surrendered to Montgomery on November 3. Montgomery continued on to Montreal and Carleton, whose forces were depleted from the fight with Allen, fled north to Quebec City. This allowed Montgomery to march into Montreal without opposition. Montgomery left Brigadier General David Wooster in charge of Montreal and continued on to Quebec where he met with Colonel Benedict Arnold's battalions of New England militia. They had braved an arduous journey across the forests of Maine to meet Montgomery in December. Many had died along the way of starvation or illness and many had deserted. Montgomery and Arnold attacked Quebec City at 4 am on December 31, 1775, but were badly defeated. Carleton was waiting for them and began firing when they were in range of the city's walls. General Montgomery was killed in the first fusillade. Benedict Arnold was wounded in the leg. Arnold tried to keep up the siege but was forced to give up. Over 60 Americans died and more than 400 were captured in the Continental Army's first defeat. The Americans stayed at their posts in Montreal and surrounding Quebec City until the spring, still hoping to take the city. When newly appointed General John Thomas decided continuing the siege was pointless, the Americans fell back to Fort Ticonderoga in New York, never again to fight on Canadian soil.